I hear the voice, that cute, clear little voice - that voice I would recognize anywhere: "Hi Papa. I miss you." Then another voice: "Papychkin, where are you?" It's all I can do not to cry. Ok, I admit it, I do cry, although I try to hold it together for them. Only after we speak do I run to that one place I can cry in private: the toilet stall. Where others go to poop, I go to cry. Thankfully, this was not another one of my vivid prison dreams, although I've had plenty similar. This was an honest-to-goodness conversation with my beloved children, the first contact I've had with them in 7 weeks. I have not spoken with them since I checked myself into this joint. No way to call them, no way to Skype. No way to mail. Prison is still in the dark ages when it comes to international communications. But now they are here. Close. Only two hours away. In the same country. In the same state even. They arrived last night after a long flight from Moscow. The prison phones were already off for the evening so I first spoke with them just moments before I sat down to write this. Usually my posts go through a bit of filtering. Not this one. It's direct from brain to keyboard. After all of our forced separation - that endless period following my abrupt departure from Russia in 2011 - it's almost too surreal to believe. I've dreamed about this - their move - for years, about once again being close on a daily basis, about regaining a foothold in their everyday lives, about tucking them in for bed at night just like a normal father. There's only one small catch: my dreams did not involve prison. The desire to be out there with them is almost too much to bear. Yesterday I could barely weed whack so intensely did I want to be standing at the airport to meet them, to kiss them, to wrap them in my arms. When I heard their voices this morning - so close yet so far - it was all I could do not to run from this joint to meet them. While my situation is a bit extreme, what I'm getting at is the true pain - the real frustration - of prison. Despite my many blog posts to the contrary, it's not the food or the bunks or the guards or the showers that make prison so difficult. It's not the bureaucracy, brutality or indifferences. 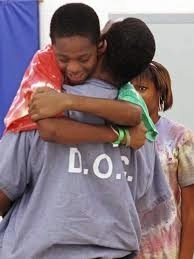 What makes prison difficult, above all else, is the prolonged, enforced separation from loved ones, from the innocents on the outside that suffer right along with us. I call it the pain of forced separation. And it is suffered by all of us in here, whether our family is just down the road or a continent away. Something about the fact that we inmates forced this hardship, these trials, on other, innocent parties, friends and family who are out there struggling because of us, and who we are unable to help from behind these walls, is particularly awful. This helplessness compounds the pain. I know that I'm not the only one to suffer this pain of separation, this guilt of suffering, this overwhelming desire to be there for my loved ones. I see the pain in the eyes of other inmates as they sit at the phones. And in their excitement and longing when they run to their bunks to open letters after mail call. Or in the anticipation with which they await visiting day. Although in our daily lives here we hide our true feelings beneath a facade of toughness, the pain of separation endures. My family's move, of course, holds out the promise of weekend visits, of daily calls. It also means a lot that has nothing at all to do with me: a chance for my kids to experience normal American life, to go to a neighborhood school, to make new friends. It also, I'm sure, will entail some hard adjustments. My kids were born in the U.S. but have never lived here. Their mother last lived in the States in 2001. That's what worries me: I won't be able to help them, to support them, to problem solve like a normal father, from at this camp. 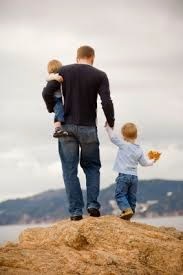 But that feeling, that frustration, just encourages me and spurs me on to redouble my efforts to be there for them now in the limited ways I can, and to keep focusing on bettering myself and planning for the future so that when I do get out, I can be the father that I want to be, that perhaps I once was. My heart breaks for your kids. Still, I have a strong feeling you'll remain strong and focused. For them. As you observe, you've got nothing but time now. And the old adage of time healing wounds is true. So keep strong.